Cookies: Cookies are text files that store some information on your computer's hard drive and allow our systems to recognise your browser. Cookies collect information like IP addresses, operating systems and browser software, but they do not collect any personal information. Cookies let you customise your experience at our Site. Personally Identifiable Information: At some Steuarts Tea Australia pages, you can order products, register for materials, make requests, enter contests, vote in polls or otherwise express an opinion, subscribe to one of our services, such as our online newsletters, or participate in one of our online forums or communities. The types of personally identifiable information that may be collected at these pages include: name, address, e-mail address, telephone number, fax number, credit card information, and information about your interests in and use of various products, programmes, and services. Data collected online may also be combined with information you provide when you register your ownership of Steuarts Tea Australia products. 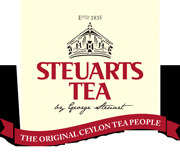 Steuarts Tea Australia uses your information to better understand your needs and to provide you with better service. Why We Collect Your Personal Information: To process your request, we will ask you for your personal information such as: name, e-mail address, PO Box address, telephone number and credit card information. Mailing Lists: Creative occasionally provides the opportunity for visitors to supply their email address for the purpose of receiving a specific newsletter or product information. These email addresses will only be used for this purpose and will never be shared with unaffiliated third parties. In addition, where applicable, we will follow all local requirements, such as allowing you to opt in before receiving unsolicited contact. How We Protect Your Information: electronic and managerial procedures to safeguard the information that we collect online. We use encryption when collecting or transferring data such as credit card information. Access To Your Information: You have the right to access and correct your personal information at any time. To review, update or make changes to your personal information, please contact us.